It's a well-known fact that unlike dogs, cats do as they please. 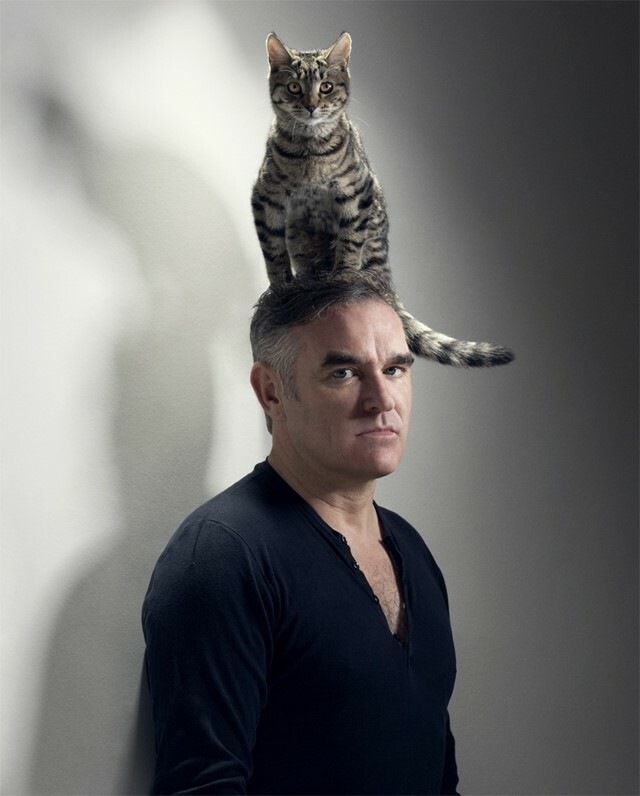 And it's exactly this which makes the brilliant image of Morrissey with a cat on his head so uttlerly brilliant. The image, shot by Jake Walters in 2010, was originally taken for the cover of Guardian Weekend and has later been used by animal rights organisation, PETA. The image was shot by photographer Jake Walters who has shot Morrissey throughout his career. The cat, a beautiful Bengal named Fanny, belongs to Walters. "Morrissey and I have been friends for a long time, probably around 20 years. He's an animal lover and was desperate to meet her when I first got her," Walters explains. "It was love at first sight, I didn't even get a look in." Morrissey expressed interest in doing a picture with Fanny. "I can't remember who came up with the idea of sitting her on his head," Walters remembers. "But because it's Morrissey, I'll give the credit to him." Bengal cats are known for their lush, dense, and remarkably soft coat and distinctive leopard-like spots. The Bengal's muscular, athletic build is one of its most defining features; it is never delicate. Because of its feral lineage, the Bengal is often assumed to be difficult to handle, but the reverse is true. Breeders insist that the Bengal can be tamed easily and is affectionate, though it is not a lap cat. However, it does enjoy human company, and will often stay close to its family members. "Fanny was younger and subsequently smaller which made it easier for her to sit on Morrissey's head"
"I didn't know if she'd manage to pull it off," Walters explains. Fanny was younger and subsequently smaller than the slender, elegant lady she is today, which made it easier for her to sit on the musician's head. "There are a couple of shots but the one where she is looking at the camera straight on is my favourite," Walters says, "It looks like she's been there forever when it was only actually a few seconds. Her expression is brilliant – she's so self-possessed like she knows everything and we're the idiots and underneath her is Morrissey." It's interesting to discover what Morrissey's reaction was when he first saw the picture – an artist who known for his bleak lyrics and morose manner. "He really loved the shots. When he likes something, he really lets you know," says Walters. The unique cat-on-head moment also bought Morrissey and Fanny closer together. "When we speak, he always asks after her. Morrissey has his own cat who kept visiting his mother's house. The cat already had a name: Dude. "We often chat about Fanny and Dude," Walters laughs. Morrissey, an advocate for animal rights and has been vegetarian since he was 11-years-old. He has explained his vegetarianism by saying "If you love animals, obviously it doesn't make sense to hurt them." Walters first met Morrissey in 1991 through a friend. "We got on straight away." Morrissey needed a driver and Walters who was in-between jobs volunteered. "The first pictures I ever took were of him," Walters admits. "The hardest thing about photography is not F-stops and shutter speeds and lenses and cameras, that’s so meaningless and boring. The hardest part is working out where to point the camera. I had a (great) subject and so that part was done. I took a couple of pictures and he looked at them and used them as single covers and that’s when the penny dropped. Walters enrolled at the Surrey Institute and has worked as a successful photographer ever since, contributing to AnOther Magazine, Dazed & Confused, Vanity Fair and British Vogue. Many of the shots of Morrissey have been used for single and album covers. "I've got loads of unseen material of Morrissey which I'd love to make a book out of one day. I'm just waiting for someone to ask." It's at this point in the interview Fanny interrupts, jumping onto Walters' legs, almost as if to suggest the focus returns to her. Cats love to be the centre of attention. Read about Maddie, the amazing dog who stands on things, here. The ICA host Smithsfest, this weekend, a two-day festival comprising talks, performance, art and film celebrating The Smiths. For tickets and information click here.